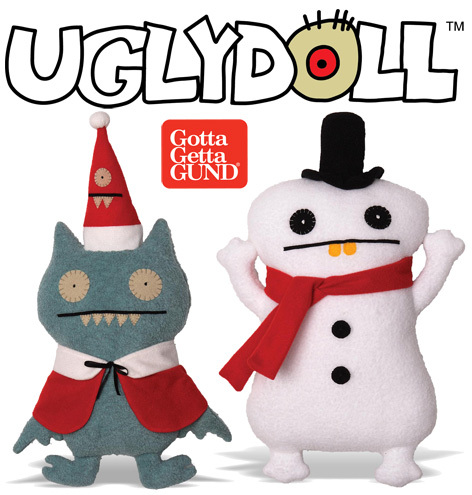 This enchanting pair of characters from Uglydoll has Christmas written all over them. Featuring Babo as the Ice Bat, he’s going undercover to discover the secrets of how a Snowman survives the winter and then melts away to nothing! Suitable for children as young as one or over, these lovable soft toys stand around 35 cm tall and are hand washable in case of dirty finger marks. As part of a much bigger range of Uglydoll toys, the Christmas Set joins the popular Halloween pair who set out on their trick or treat missions. © 2014 Pretty Ugly, LLC. All Rights Reserved. Created by Sun-Min and David Horvath. As all Uglydoll fans know, every character is said to “inspire creativity and promote an inner confidence that ‘we are all unique in our own special way’”. Available from all good independent and online retailers, the Uglydoll Christmas Set is high on all fans wish lists. Please tell us what you think of the Uglydoll Christmas Set by Enesco and Gund.